Se-tenant means two or more different stamps printed on the same pane or sheet of paper. They can be stand-alone designs or part of a larger work of art. 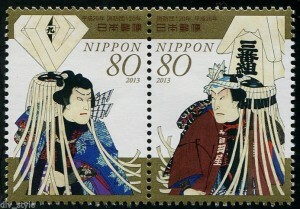 In the example above from Japan, the two stamp designs are complimentary but not necessarily part of a greater work of art. Notice how the artist is careful not to carry the costumes from one subject into the stamp frame of the other. The art is truncated before it runs into the perforations, with only the background colors tying the two designs together. In the second example above, this time from New Zealand, designs in the strip of five commemoratives run together, crossing the perforations that divide one stamp from another. Each stamp forms a part of the greater work of art. Se-tenant (pronounced see-TEN-ant) stamps are fun to collect and some philatelists make them a speciality.